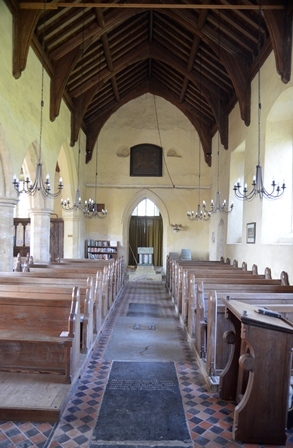 I had arranged to play at Metfield church at 11am, in order to have time to warm up in another church beforehand. 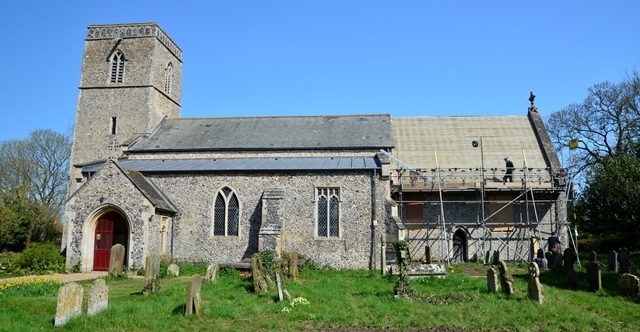 Consulting the map, I decided to make a start on ‘The Saints’, the 12 villages of South Elmham and Ilketshall all named after saints, of whose churches 11 are still in existence. I hadn’t realised they were all so close to Metfield. 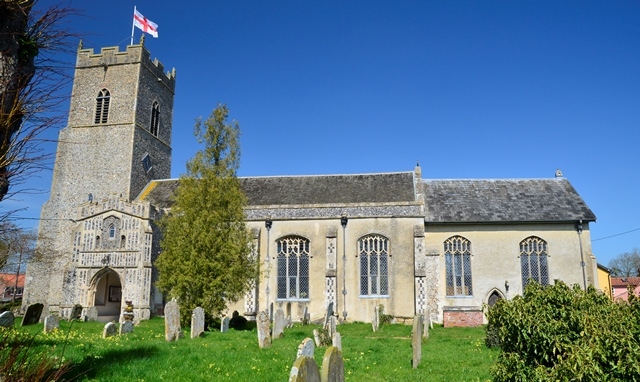 The drive outside the church was busy: the noise of chainsaws and a wood chipper accompanied the sight of tree surgeons in their customary orange hats, and a truck full of gravel was parked by the churchyard gate. 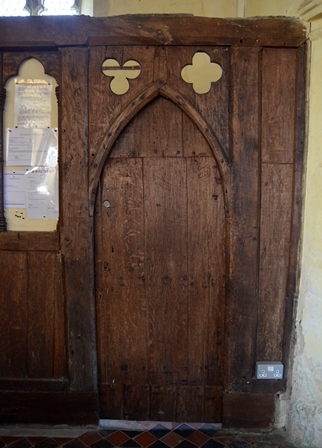 Two men were laying it on the church path, and the chancel was missing its roof. It appeared to be raining, but it wasn’t water coming from the sky. I couldn’t tell what it was; I thought perhaps it might be ash from a nearby bonfire. I feared for a moment all this activity might prevent my playing in the church, but I was informed that there was no indoor work taking place. It was already a warm day, and I was surprised to find the church interior felt pleasantly cool, rather than cold, in contrast. I didn’t think the warm weather would yet have had a chance to influence the indoor temperature more than a degree or two; and indeed, 12.5˚C was colder than I would have guessed. 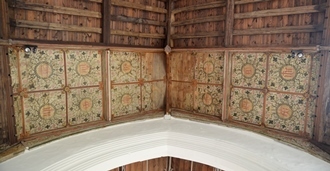 I could see the sky through the chancel roof, and hoped the tiles would be replaced before the weather had a chance to change its mind. The church felt friendly and its acoustic was good. I practised the Bach C major suite in preparation for possible listeners at Metfield: it went better than I expected, so I felt I could risk playing the piece through there if necessary. 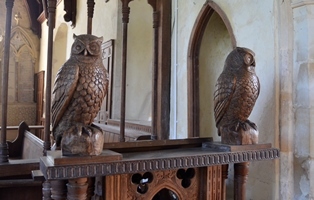 I left just enough time afterwards to look at the old font, pretty wooden screen beside the entrance and the large owls on the lectern, keeping their sharp eyes on any members of the imaginary congregation not paying attention to the sermon. 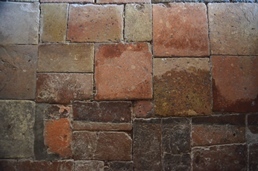 I returned to my car to find the wood chipper moved to the drive, and I could see now that the rain was sawdust. My car was covered in wood chippings, and as I opened the door to put my cello inside, the seats became covered too. Still, after our recent weather, I was far happier with the idea of wooden rain than watery rain. My car would certainly not be any messier for the addition of a bit of wood chip. 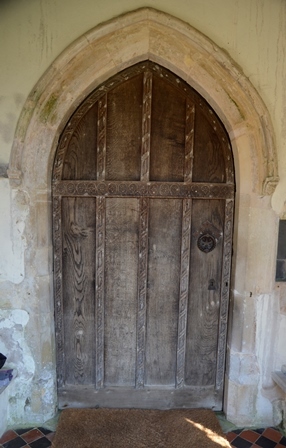 As I approached the open door of Metfield church at a minute or two past 11am, I heard a sound which was unmistakeably that of a crowd. A concert audience. 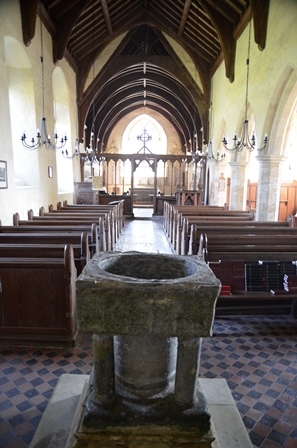 But the aural evidence didn’t persuade my disbelief: I had to wait until I entered the church and was confronted with the sight of thirty-odd people chatting and drinking tea before I could quite accept this as fact. I was shocked, and momentarily alarmed at the prospect of performing a piece that was not yet at (my definition of) concert standard. But shock soon turned to delight at such a smiley gathering looking pleased to see me on this sunny spring morning, in a beautiful church interior. Logic eventually put my fears at rest: there were hardly likely to be any professional musicians in the audience, and if I explained I wasn’t expecting such a large audience and that plenty of practice was still required before my concert in ten days’ time, I was sure they would simply enjoy the music without sharing any of my performance worries. The acoustic assisted me greatly, and I decided to play the whole piece, repeats and all. I got through it with no stamina trouble, and wasn’t displeased with the result. It was the first occasion of the year on which I felt overheated by the end of my performance, which in itself was a cause for celebration after the long months of cold endurance. So, I felt the early dress rehearsal served a good purpose, for me and the appreciative audience, and we all enjoyed ourselves thoroughly. Accompanied by a welcome cup of tea, I chatted to some of the residents of Metfield afterwards, including one 93-year-old lady who told me she was at Christ’s Hospital school at the same time as my father – during the war – although the girls’ and boys’ schools were at separate locations in those days. I didn’t believe her at first when she told me she was older than he would have been; she didn’t look 93. It reminded me that I’d not long ago been sent a photo of my father there as a teenager by the daughter of his English teacher, Edward Malins, with whom he played chamber music. 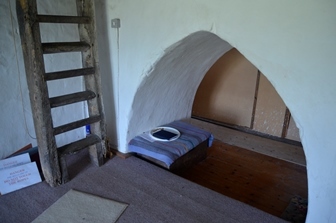 Edward Malins’ wife, Mitzi, used to come and stay with us in Suffolk nearly every summer after his death, until her own death when I was 15. That, I think, must be an indication of the regard in which my father held his school teacher, and the photo was especially precious to me as I’d never before seen a photograph of him at that age. I have Mitzi to thank for many of the photos I have of our family, house and garden during my childhood: my father never took photos, and my mother rarely did. Not only was the gathering a great joy, but the church itself was beautiful and bright. 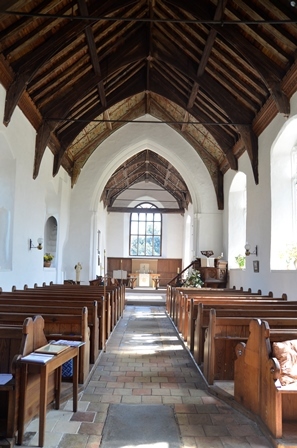 The old floor was just to my liking, and the front of the nave roof was decorated in a similar way to Stowlangtoft: I have only now found out that this is a medieval ‘canopy of honour’1. An imp was pointed out to me (see header photo). ‘How do you know it’s an imp?’ I asked. Imps, I found out by looking them up afterwards, are supposedly unattractive and mischievous, but I thought this one looked quite friendly. But legend has it it’s an imp, so who am I to question this wisdom. 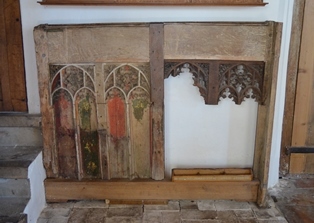 The original rood screen was leaning against the back wall of the nave, awaiting restoration. 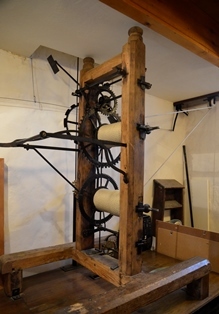 I was shown an impressive 17th century clock mechanism that still powers the church clock, and taken up to the gallery and bell stage, where one had to bend down to pass through the top of the tower arch. 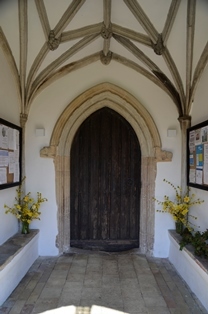 The final details I paused to admire were the porch and the cowslip meadow in the churchyard. 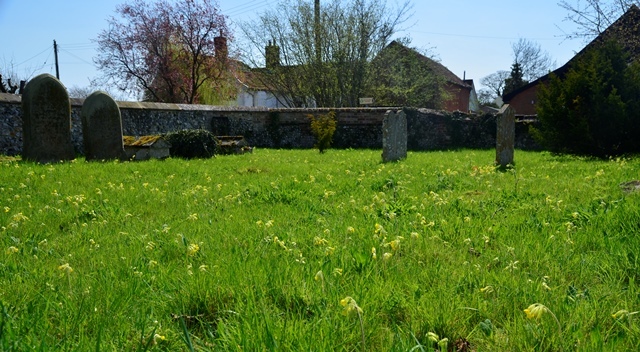 I was thrilled that so many of the churchyards I seen recently were managed as wildflower meadows, and this was certainly the season to make the most of them. I was sorry when the morning came to an end. 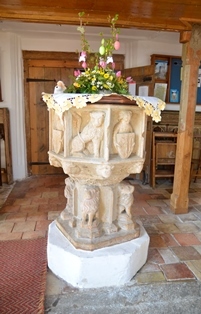 But before leaving, Judy, who had helped organise it, informed me that the church had received £115 in donations, despite the fact the subject of donations hadn’t been so much as mentioned to the audience. 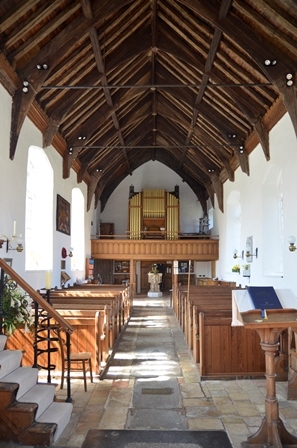 After I declined her offer of paying my expenses, explaining that as far as I was concerned I was on holiday, she said the money would cover the church’s concert license for the year. What a fitting use for it, I thought. Music perpetuating music.